It’s not a good sign when the first thing that pops up on screen is a cornball, embarrassingly dated rapper who talks up how wonderful the rest of the show is going to be, like a high-school principal trying desperately to get in touch with youth culture without really knowing what he’s doing. But I suppose the Rappin’ Ringmaster didn’t seem quite so terrible when “The Greatest Show In The Galaxy” was originally broadcast, at the tail end of Sylvester McCoy’s second season as the Seventh Doctor. Which is also, at least where I’m coming from as a viewer, something that can be said about the Seventh Doctor era in general. This period of the show has plenty of champions among Doctor Who fans, not just among the Internetigentsia, but pretty clearly in the ranks of the folks who make new Doctor Who shows today; I think it’s safe to say that the spirit of seasons 24-26 has had a greater influence on Russell T. Davies’ and Steven Moffat’s versions of the show than anything that came before. When you look at this era in the context of the long and tortuous evolution of Doctor Who as a series, there’s a lot to admire, with a plethora of ambitious ideas and creative energy. “The Greatest Show In The Galaxy” is a great showcase of this trend, showing a significant and progressive improvement over the disaster of the Sixth Doctor era. But try as I might, I’ve never been able to warm to this era, certainly not to the extent of the sizable number of fans who call it the zenith of classic-era Doctor Who. Because for all they were doing right here, it too often feels thin and amateurish, with potentially good concepts too often marred by sloppy thinking, lame execution, and tacky gimmickry. At its worst, it makes me feel a little mortified to be a Doctor Who fan in the first place. Exhibit A: the Rappin’ Ringmaster. So, with that said: what were they doing right here? Most importantly, the sour and misanthropic stories favored by previous script editor Eric Saward were history. Andrew Cartmel’s vision of Doctor Who was more hopeful, more whimsical, and much more fun. It aimed, I think, for the bantery, light-hearted approach that typified the best of the Fourth Doctor/Romana seasons, not coincidentally the last time the series had pulled in large ratings. The show also leaned more heavily on the fantasy side of science-fantasy, which is particularly apparent in “Greatest Show In The Galaxy”: With its reliance on mysticism and allegory, and especially its tres-1980s fixation on the broken, corrupted legacy of the 1960s counterculture, this serial wouldn’t be at all out of place next to Neil Gaiman’s Sandman. Also key to making Doctor Who fun again was a major shift in how it portrayed the Doctor himself. Instead of the incompetence and grating unlikeability of the Saward-created Sixth Doctor, Cartmel and McCoy’s Seventh was both more comedic and more heroic, and much easier to like. Still, it took a little while for them to figure out exactly how to make that work. As introduced, Seven was a buffoonish clown who seemed more likely to win the day by accident than because of his own competence. As time went by, Cartmel started toning that down and giving him a more devious side—one who was several steps ahead of his enemies and often knew exactly what was going on before the story had even begun. That’s the Doctor who appears here—though it’s not until the final episode that he shows his true self. At first, he’s very much in clown mode, practicing his skills of dexterity with a book called Juggling For The Complete Klutz and annoying his teenage companion Ace by playing the spoons. Soon enough, they get their invitation to start the plot off when an endearingly goofy-looking “junk-mail robot” materializes inside the TARDIS and shows them an ad for the Psychic Circus and its talent contest. The Doctor’s intrigued, but Ace has to be talked into going. She’s more intrigued than she’s willing to let on, but she’s caught on the horns of a teenage dilemma—on the one hand, she thinks circuses are just kids’ stuff, and on the other hand, she still thinks clowns are scary. But with a little gentle cajoling from the Doctor and a dare from the little ‘bot, she’s convinced to put her courage and curiosity ahead of her fear. 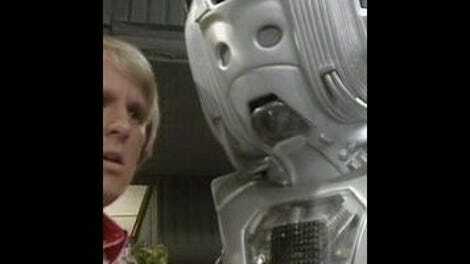 Of course, there’s something mysterious and evil lurking at the heart of the Circus, and much later in the story, it becomes clear that the Doctor has known the secret all along—which would appear to make the robot’s invitation a plot hole, since in these early scenes he acts as if he’s as much in the dark as Ace is. But it seems likely that he’s just pretending for Ace’s benefit, as a subtle means of convincing her to do something that will be a learning experience for her. It’s certainly not the last time he’ll play the fatherly mentor figure to Ace, and it seems possible that sending the robot was his idea, not the Psychic Circus’s. He could have just landed the TARDIS and pretended that it was yet another random journey, but if you watch McCoy as he talks with Ace in the TARDIS, it’s clear that the Doctor thinks it’s important that Ace chooses to visit the Circus rather than be forced into it. So there might be a double meaning when he calls the robot “just a device to get us to go.” Or a triple meaning, maybe—it’s already both a mechanical device and a plot device. The planet Segonax, where the Circus has set down its roots, is an awfully bleak spot, apparently consisting of mile upon mile of rocky but otherwise featureless white landscape—probably a budget-induced consequence of filming all the location footage in a quarry and a parking lot, because the dialogue implies that there should be a city, or at least a bunch of local townsfolk living nearby. This odd underpopulation doesn’t help the story’s verisimilitude, but at least it focuses your attention on the main plot, since there’s almost nothing else to catch your eye. Ace, it turns out, wasn’t wrong about the clowns. The talent contest is a deadly ruse, drawing an interplanetary parade of contestants like flies to a spiderweb, and killing them off in much the same way. (There’s even something a little spiderlike about the circus tent seen from outside.) All the acts are judged by the audience—consisting entirely of what appears to be a small middle-class family, all oddly unemotional and easily bored. And if they don’t like your act, they’ll turn you into dust. The family isn’t part of the circus itself, but the carnies ruthlessly devote themselves to pleasing the strange trio—or at least keeping them from boredom, for fear that the carnies might be the next ones on the menu. And that means that procuring a constant supply of fresh meat is of paramount importance to the circus leadership—the creepy Chief Clown, who’s in charge of a small platoon of sub-Bozos, along with the Ringmaster and Morgana, the gypsy fortuneteller/ticket-taker. The Doctor and Ace are quickly caught, caged, and made to wait for their audience with the audience. They’re joined by a motley crew of other amateur talent. I’ll get to them in a second, but it’s probably easier before I do that to talk about the other weird thing about the Psychic Circus—it’s not just that they’re killing people, but that something about the whole setup is oddly reminiscent of the way TV works. This isn’t accidental, and you don’t have to dig too deeply to see the allegory at work here. Cartmel and scriptwriter Stephen Wyatt painstakingly set up all the characters we meet as metaphorical placeholders for various elements surrounding television production and, more specifically, Doctor Who itself. In fact, I get the feeling that they were far more interested in making “Greatest Show In The Galaxy” work on this metaphorical level than in trying to tell a story that made sense on a more basic level, because the allegorical elements are so strong that they often work against the characters being more than one-dimensional caricatures. I’ve already mentioned a couple of our allegorical players. The easily-bored family in the stands, it’s not hard to see, stand for the viewing audiences whose ratings and attention spans are life and death for TV shows. The evil trio who lead the Circus, meanwhile, are the network executives who desperately throw programming into the ring to try and figure out what their audience won’t find deathly dull. They’re not creative artists themselves, significantly—the circus folk who actually make things are on a significantly lower social level, and I’ll get to them in due time. The most notable of the other talent-show cannon fodder are a blustery old intergalactic explorer, Captain Cook, and his young companion Mags. Again, it’s not hard to see who they’re meant to represent, especially since they quite literally mirror the Doctor and Ace in one significant shot. But they’re not so much parodies of the 1988-era TARDIS crew as they are a satire on the older eras—with a large part of that being a nasty sendup of the arrogant, domineering blowhard Sixth Doctor and the perpetually put-upon Peri, whose relationship is closest to the abusive one that the Captain and Mags have. The Captain is a false Doctor, a failed Doctor, one who travels the spaceways but doesn’t care about or help any of the people he meets, whose stories are boring and endless, and who sees his own companion as little more than an animal. Mags, werewolf though she is, winds up being one of the story’s most sympathetic characters. 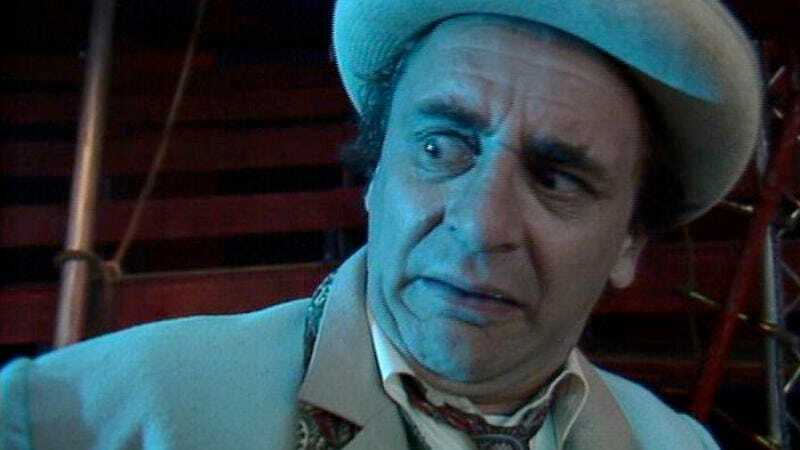 In a way, the Seventh Doctor makes up a little bit here for his predecessor’s awful treatment of Peri by helping Mags escape her dysfunctional, abusive version of a Doctor/companion relationship, get out from under the thumb of the paternalistic old goat, and travel instead with a cleaned-up, revivified Circus. If the Captain and Whizzkid sections are more than a little sour and wrongheadedly defensive, the lesson embodied by the Circus’ uncorrupted old-guard is much easier to swallow: Creating something that’s beautiful and artistic and unique is a worthy goal, and maybe the most worthy of goals. Certainly worthier than chasing fame and ratings. And that’s the thread that’s finally picked up by the Doctor when it comes time for him to make his final move against the real villains of “The Greatest Show In The Galaxy,” the bored and bloodthirsty family watching from up in the cheap seats. The sell-out Chief Clown, despite that Ian Reddington’s performance is by far the most creepy and chilling thing here, is ultimately just a sideshow. The danger is who he’s sold out to: Finally revealed as the Gods of Ragnarok, they’re essentially living embodiments of the audience as consumer and destroyer, unimaginative and ultimately unappreciative of what they’re feeding off. The kind of people who watch NASCAR races hoping for a fiery crash, and watch reality shows hoping for someone to get murdered or OD. “You're not interested in beginnings,” the Doctor notes. “You're only interested in endings.” More to the point, they feed on creativity but don’t really understand it. To fight them, brute force will be less effective than imagination, and so the Doctor’s weapon of choice is a whimsical, vaudevillian magic act, the polar opposite of grey, grim statues that require entertainment but can’t feel joy. This is all much more interesting in concept than in execution, unfortunately. For one thing, there’s the sloppy attempt to make the Gods Of Ragnarok more than just garden-variety cosmic menaces but a group of powerful pseudo-Lovecraftian devils that the Doctor has supposedly been fighting for many centuries. That’s problematic. On the one hand, it makes complete sense for this serial’s this-is-all-about-TV metaphor, because they represent the force that really is life or death for a TV show: Viewership. Bore them, and your show gets bad ratings and gets killed. Entertain them, fickle and hard to please though they are, and you get to live. That’s a clever concept, and it’s too bad it didn’t go any further than that. But telling us that the Gods have actually been on the Doctor’s active radar for centuries is tantamount to making them Doctor Who’s main villains retroactively back to 1963, despite being completely unheard of by the audience before now. It would take a narrative genius to pull off throwing a twist like that into a series at the end of its 25th season, but I haven’t seen a Cartmel-era episode yet that didn’t have trouble handling some of the basic elements of storytelling, whatever its other merits. “Greatest Show” is jam-packed full of interesting ideas and ambitious concepts, as are many of the stories in these last few pre-cancellation seasons, but it’s an amateur’s ambition: A lavishly conceived New! Major! Villain! isn’t that impressive when it’s still one-dimensional and thinly written. • “Greatest Show In The Galaxy” came out on DVD in June from BBC Video, completing the collection of McCoy’s Doctor Who serials. • The Gods Of Ragnarok seem to have only two ratings: 0-0-0, meaning instant cancellation, and 9-9-9, apparently an endorsement of Herman Cain’s tax plan.